I think we can all agree the world would be a much better place if arguments were settled with song. As musicals like Grease, High School Musical and Footloose have taught us, it’s always better to take your frustrations out while singing. So while millions of viewers across the world watched in horror as Donald Trump and Hillary Clinton battled it out over the Trump tapes, Clinton emails, tax, and Syria during the second presidential debate, others saw the opportunity for humour. 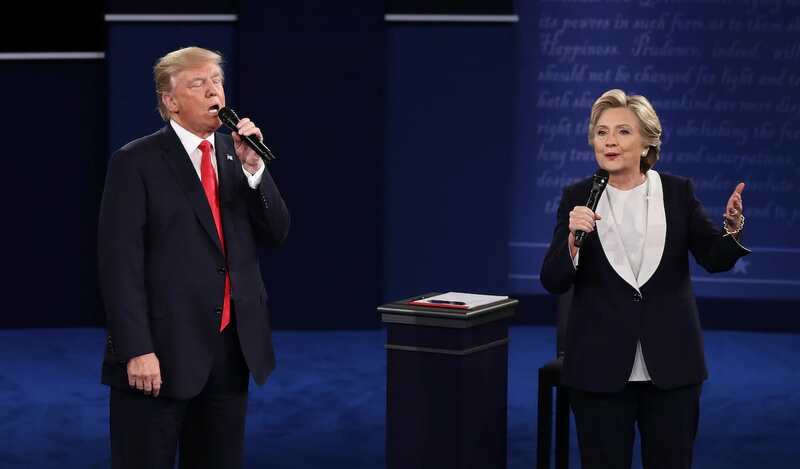 The combination of a perfect song, microphones, roaming candidates and the audience made a pretty great backdrop to an alternate debate much better than the one we witnessed on Sunday – one where Trump and Clinton were serenading each other. The video, from dutch channel Lucky TV, shows us what politics should be. "I got chills, they're multiplying"
YOU PROBABLY THINK THIS ELECTION'S ABOUT YOU! "Anything you can do I can do better!" "I can do anything better than you!" Either way, this would have been a much more entertaining way to watch the debate. I’m hoping for much more of this after the third presidential debate on October 19th.